The parting chisel when used produces a cut originally said to have the appearance of visually separating or parting the wood; hence its name, though obviously it has the shape of a 'V' which provides its common name. If the tool is correctly shaped it should incorporate a sharp underside down the length of the shaft where the wings - sides - meet. It was pointed out to me by a tool manufacturer that when viewed with a magnifying instrument sharp features will ultimately still be rounded; but I'm not in a laboratory, I'm in a workshop, where it should appear sharp to the naked eye. 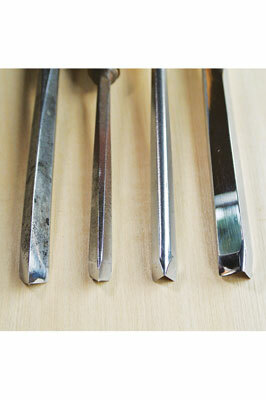 A 'pip', 'hook', 'horn' or 'prong' is produced when shaping and sharpening this tool correctly due to the different metal thickness of the wings and the bottom of the chisel's cutting edge. There are differing opinions to whether the pip should be incorporated or eliminated - my view is that if the wood is being cut smoothly on each side and with a sharp bottom to the cut, then either will do, don't worry. Unfortunately, to eliminate the pip some carvers and manufacturers grind the bottom of the cutting edge and the shaft round, some stipulating it is essential that there should be a gouge - round - feature at the bottom of the cutting edge. 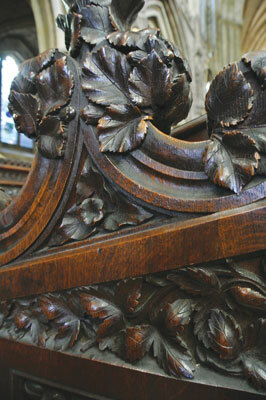 These actions only result in the bottom of the 'V' cut within the wood having a round bottom that actually replicates the character of a fluter with flat splayed sides and not a parting chisel. Rounding the underside of a parting chisel creates a bulky wedge shape at the bottom and behind the cutting edge which binds the tool when creating deep cuts, especially in hard timber. Rounding the bottom of the cutting edge and the shafts does make them easier to sharpen and possibly easier to manufacture, could this be the reason why it's done? These chisels are renowned for being difficult to use because one side of the cutting edge is always working against the grain of the wood, making it difficult to generate a clean cut. For this reason I can't understand why instruction is given for using them to cut letters. 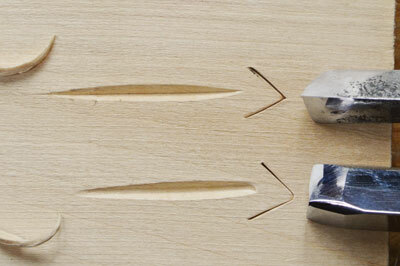 If using them to cut a letter 'O' there will always be one of the wings working against the end grain, what a waste of time, especially on smaller letters! 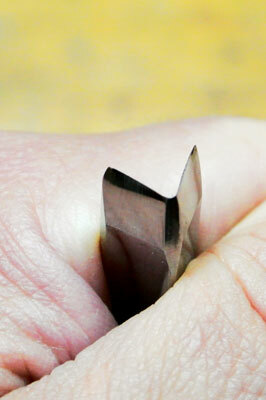 It is also difficult to form the shallow and deep cuts within the 'O' using a parting chisel. I will explain in a future article a much simpler and efficient way to cut letters, I know it has been covered many times but not in the way I was trained! Likewise many times instruction is given for these tools to be used for cutting around your design in the wood, particularly in relief carving before the actual carving starts. This sharp cut - if shaped correctly - is hard to eliminate when mistakes are made - and we all make them - so I tend to use the much friendlier fluter with its rounded bottom for the reasons stated in the last article. It would be logical to use your round-bottomed parting chisel in this situation if you wish; after all it is a type of fluter. There are variations to the parting tool where the wings are curved outwards called 'winged parting chisels' but these are used only for specialised work in mass production situations. I only use parting chisels when involved in mass-produced items where one cut with this chisel necessitates two cuts with another, so in commercial terms saves time by reducing the cuts by half. But for generating only a few incised 'V' cuts the cut from a parting chisel may be easily replicated by making incised cuts with other chisels such as a 'slow bull-nosed gouge' that can easily cut across the end grain and are versatile in many other ways. I will explain these tools in a future article. 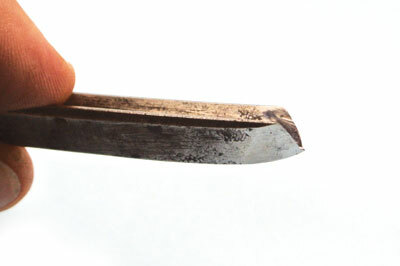 Stated in the previous article regarding the fluter, the cutting edge of the parting chisel when viewed from the side should also slightly angle back and not square to the shaft. 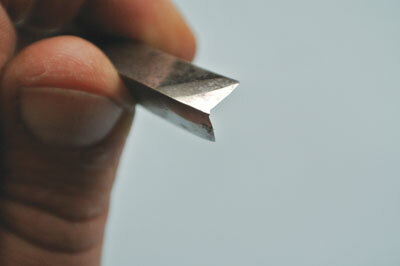 This allows the bottom of the 'V' section to be the leading cut and not the corners of the cutting edge. 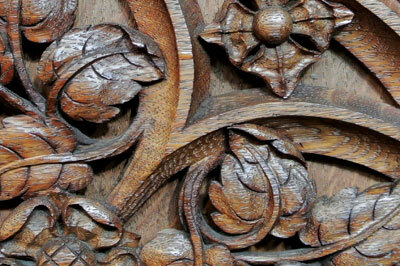 As with the fluter this has an incredible advantage when carving up to a raised form within a piece of work. Well, this is one of my larger 'soap box' moments; I have so many boxes now I construct them to fit inside each other like Russian dolls - this obviously saves space in the workshop. 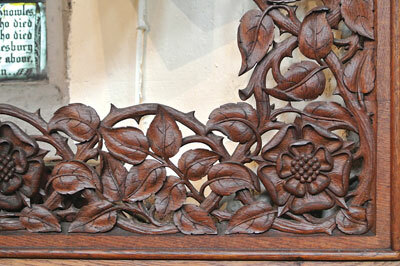 In conclusion it is unfortunate that some carvers and manufacturers include the rounded bottom that destroys the traditional cut of a parting tool. The knowledge is declining because of these actions, due maybe to commercial manufacturing reasons? For the carver a decision needs to be made whether to shape the parting tool traditionally or to round the underside, making it easier to sharpen but losing its fundamental cut; if the latter, then why not use a fluter? !